It's the weekend yippee I have not even unpacked from my summer holiday and I am packing again for a weekend away. But how the weather has changed here you can definitely feel autumn on its way. It is almost time to pack away the shorts, vest tops, sandals and kaftans sob sob I am as I have told you before a summer girl at heart and find it difficult to get excited about winter clothes. I thought I would should some outfits I like that suit this in between time. My orange toenails I think this is my last sandal day sadly. Sadly it's been raining on and off for a few days here and I'm really hoping that this is not the end of summer. 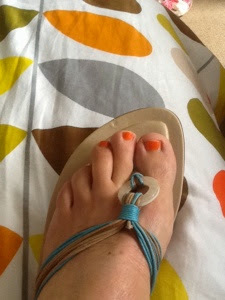 A little sunshine this afternoon meant that I wore my sandals (orange polish too!) Great choice of outfits! 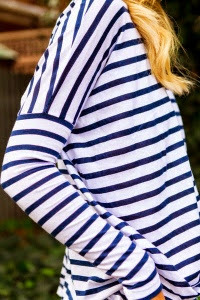 Breton striped top and jeans, white and beige are favourites of mine. Enjoy your weekend! Thanks for your comment about the Singapore Sling - your glass is a great souvenir! Some great ideas, but I am not ready to give up on summer just yet. Nice post!! I love white and beige combination!!! Gosh I always love your choices!! !White and beige and stripes, you can't beat them. Love those sandals of yours! where are they from? I like your orange color Inge! !So Summery! !And your ideas are great! !As you saw on my post,i'm drinking Irish bear in the Netherlands!Thank you for your sweet comment!Enjoy your weekend!Have fun!My love to Ireland! Muito obrigada pelas visitas e comentários Fico muito feliz quando te vejo por lá. E, desculpe pela demora em vir lhe visitar. Não esqueci de você. Lindas sugestões. Estou ansiosa pra chegar o Verão. Estamos no Inverno aqui. I know! Fall is definitely in the air. I'm trying to get in the last weeks of Summer. Have a great time! 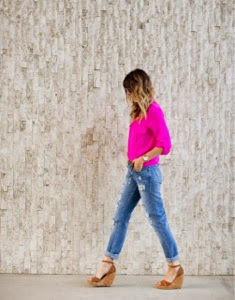 I want to wear that whole pink shirt outfit, and I pretty much need the stripes with elbow pads shirt!